When I wrote "I'll return to reality tomorrow with some real-life DOOM," I had in mind the CDC special session about nuclear detonation that had been scheduled for today. Over the weekend, that changed, as Wochit News reported in CDC Shifts From Nuclear Strike To Influenza. 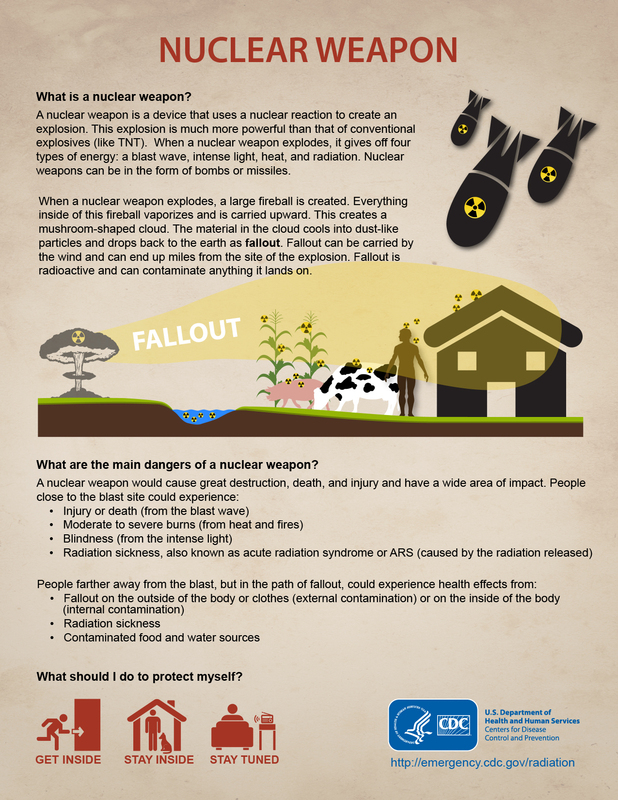 The Center for Disease Control’s January 16th special session advising Americans on what to do in the event of a nuclear war has shifted topic. It will now be about what to do in the event of flu season. As reported by the New York Times, the CDC announced the shift because the flu was particularly bad this year. The announcement read, "To date, this influenza season is notable for the sheer volume of flu that most of the United States is seeing at the same time, which can stress health systems." To get an idea how severe this year's outbreak is, ABC News reported Flu epidemic strikes US: CDC on Friday the 12th. With 13 weeks of flu season left, some hospitals face an IV fluid shortage as they treat the sick. I'll get back to the IV shortage after I share How to protect yourself when someone in your family has the flu from ABC News, posted yesterday. It probably won't be much different from what the CDC says along with the admonition to get vaccinated (I got my shot in October during my first doctor visit after being diagnosed as a Type I diabetic; there are advantages to being under close medical supervision). All of that looks like good advice to follow in the worst flu epidemic since 2014, when I wrote Flu claiming lives in Michigan and California. I did mention I'd get back to the IV shortage. That's because of the impact of Hurricane Maria. As WXYZ reported last week, Hurricane damage in Puerto Rico is impacting hospitals in metro Detroit. It was September when Hurricane Maria, the tenth most intense Atlantic hurricane on record, slammed into Puerto Rico. It claimed lives, destroyed buildings and knocked out power to the entire island. Now the U.S. territory, which happens to be home to dozens of pharmaceutical manufacturing plants, is still struggling to recover. More than 600,000 customers remain without power. It is impacting hospitals across the country and right here in metro-Detroit. Welcome to an example of "everything is connected to everything else." Who'd have thought a hurricane in Puerto Rico would affect flu treatment in the rest of the U.S. months later? Well, it is. Maybe power should be restored more quickly in Puerto Rico in order to improve health care on the mainland. One of the ironies in changing the subject of the CDC briefing and the map associated with the declaration of the the flu epidemic is that the state least affected by flu right now is Hawaii and the 50th state was the one most affected by the threat of nuclear war. Follow over the jump for that news. While the CDC was quietly shifting from nuclear detonation to flu, Hawaii experienced a false alarm of a ballistic missile attack that residents assumed would be nuclear. ABC News summarized the situation in Hawaiians panic after false missile warning alert. The FCC has launched an investigation to determine the cause for the false transmission. Between this scare and Trumps' "nuclear button" tweet, I can hardly wait to see how much closer to Midnight the doomsday clock gets moved later this month. Anyone else think it will be at least 30 seconds? Enough reality. Back to fantasy tomorrow with the nominees of the Art Directors Guild awards -- so long as we don't sick from the flu or die in a nuclear war.